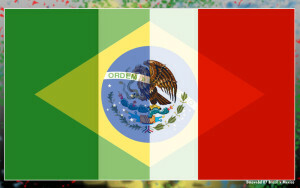 The divergent economic performances of Mexico and Brazil over the past few years have again thrust upon analysts the difficult task of estimating which factors – public policies, market trends, geographic location, financial market managers’ perceptions, or something else – are responsible for the different results. Brazil was everyone’s favorite two years ago, but Mexico is now being hailed as the hot performer – and praise is being heaped on Mexico City for making things happen. Financial markets’ behavior says more about investor perceptions than about the countries in question. Analysts focus on short-term figures rather than on structural trends. Mexico’s economy is much more open than Brazil’s because of NAFTA and other agreements with Europe and Asia, while Brazil’s is limited by the “strictures of Mercosur.” (Velasco was a strong advocate of free-trade policies while serving on President Bachelet’s cabinet.) Mexico’s “export basket” has expanded dramatically – to include car parts, electronics, telecommunications equipment – while Brazil’s exports are increasingly commodity-based. After both implemented anti-crisis fiscal packages in 2009, Velasco praises Mexico for having reduced its stimulus sooner – enabling it to keep interest rates much lower, controlling inflation better, and thereby contributing to a more robust private-sector role. However thoughtful, analyses like Velasco’s may neglect the impact of another long-term factor: the steady rise in wages in Brazil and their stagnation in Mexico. At a seminar in Washington hosted by CLALS last week, Mexican economist Luis Felipe López Calva (click here for news article) noted that the strength of the middle class continues to be a vulnerability in Latin America, and he said that the ability of the middle class to be a “lever of growth” argued for policies that emphasized economic mobility. A thriving middle class and increased domestic consumption can be a more reliable engine for growth (and for the consolidation of democratic institutions necessary for growth) than short-term market trends. The increasing wellbeing of the bottom two thirds of the income distribution pyramid in Brazil argues for tempering optimism that Mexico alone has found the holy grail of economic policies. What do you think? Click on “leave a comment” below to contribute. Mexico’s economic growth however spectacular it turns out to be, will be worthless if only the top slice of the population reaps its benefits. If the general population doesn’t benefit from it, and has an increased welfare, quality and level of life, it will mean absolutely nothing for the vast majority of impoverished Mexicans.